Animal Wildlife | Tree Frog | The tree frog is a small species of frog that spends its life in the trees.True tree frogs are found inhabiting the forests and jungles in the warmer regions all over the world.Tree frogs are best known for their distinctive disc-shaped toes on the end of each leg.The rounded toes of the tree frog gives its feet more suction and therefore better grip when moving around in the trees. There are four main species of tree frog which vary in size from just a few to more than 10 centimetres in length. The European tree frog is found in meadows and shrublands across eastern Europe but is considered endangered in western Europe. The Common tree frog is the smallest of the tree frog species and is found in a variety of habitats across south-east Asia. The Cuban tree frog is the largest of the four tree frog species ans is natively found in Cuba and its surrounding islands, but has been introduced to parts of Florida, the Caribbean and Hawaii. 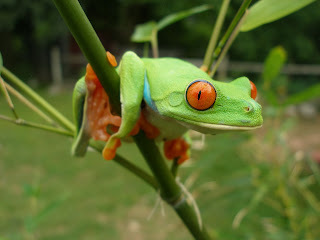 The Red-Eyed tree frog is the most distinctive of the tree frog species and is native to the jungles of Central America. 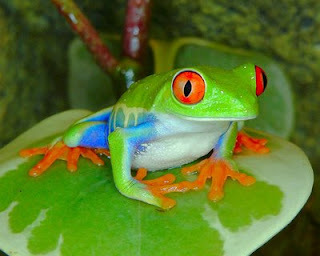 The Red-Eyed tree frog has a long narrow body and hind legs which point outwards, along with its characteristic red eyes. 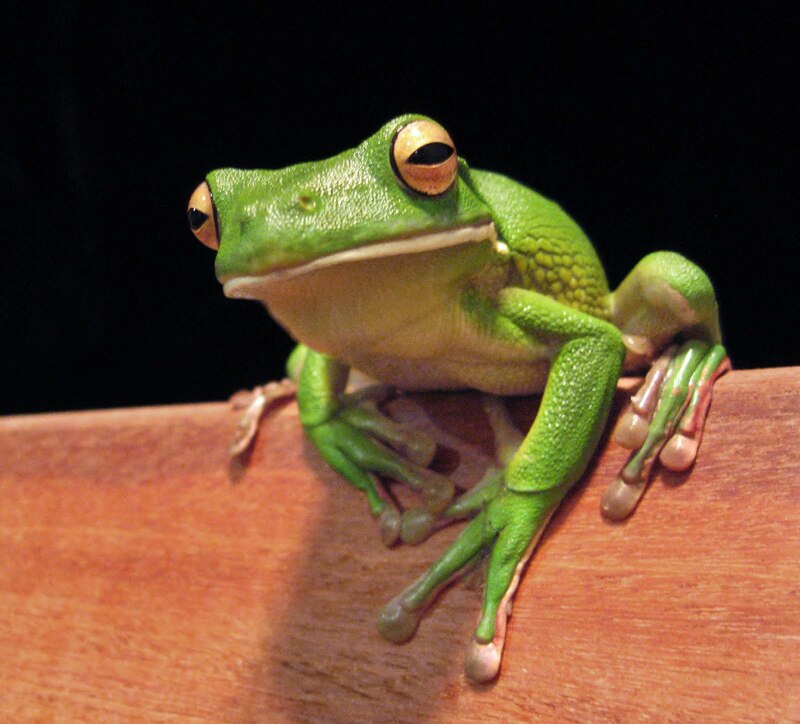 As with other frogs and toads, tree frog are generally carnivorous animals, feeding primarily on insects, worms and spiders. 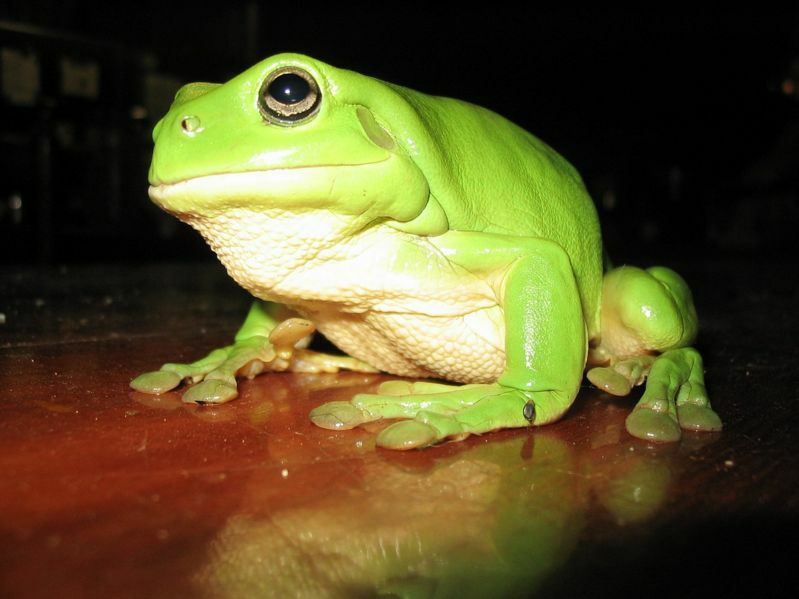 The large Cuban tree frog will eat anything that will fit in its mouth including lizards, snakes, small mammals and even other frogs. 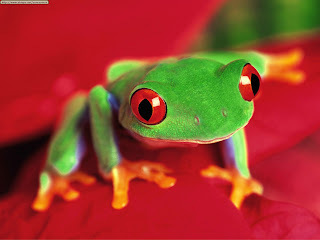 Due to their small size, the tree frog has numerous predators wherever it lives in the world. Birds, mammals and reptiles of all shapes and sizes prey on the tree frog and the tree frog is also known to be a tasty tree for large fish. 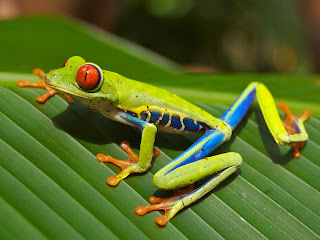 1 Response to "Tree Frog"
Can I use one of your tree frog photos on my ebook cover? I want to photoshop it to make it look like it's sitting on top of the World.